Caption: "Paul bribes an orderly so his wounded friend may have morphia. 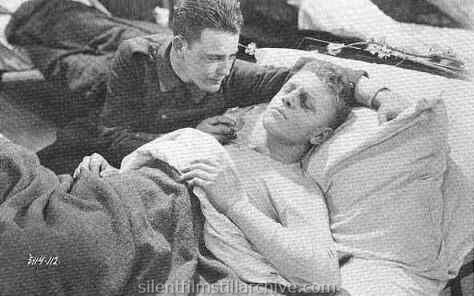 Caption: "Paul tries to comfort his dying friend." Caption: The boys are sent out on a wiring mission. 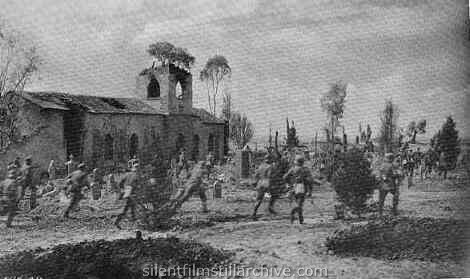 Caption: "Caught in an unexpected bombardment, the soldiers are forced to take cover in the graveyard." Caption: "Pauls' sleeve is torn by a splinter, but his arm is only grazed." 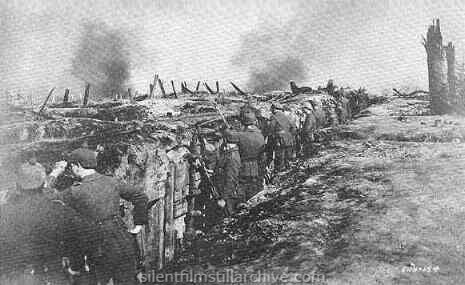 Caption: "The soldiers take their places in the trenches." 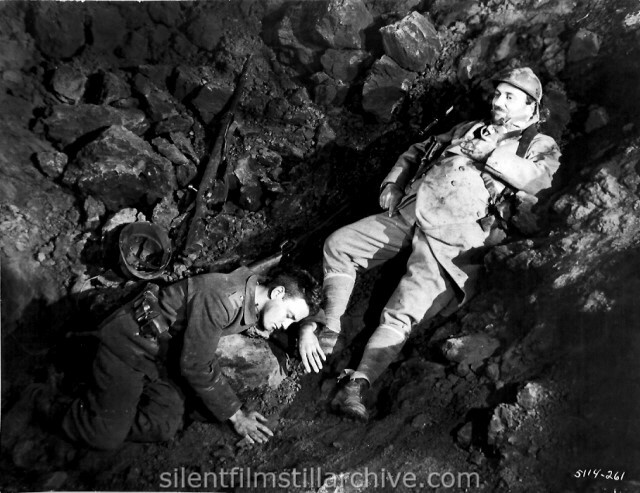 Caption: "Paul goes home on leave and finds his mother very ill."
Caption: "Paul stabs the French soldier who falls into the shell-hole where he has taken cover." 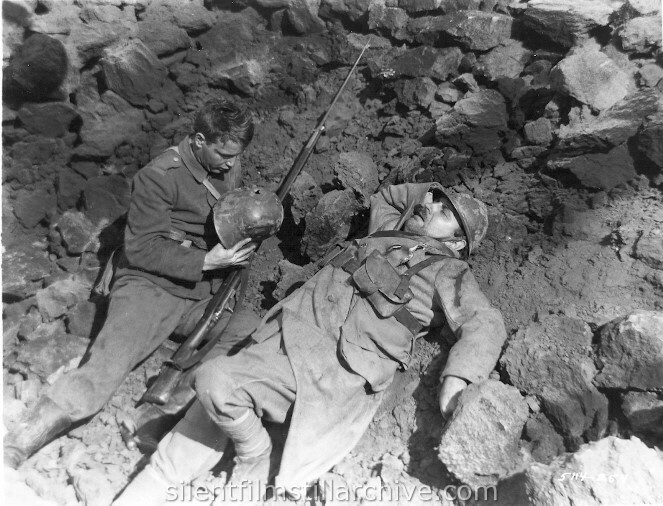 Caption: "Paul is guilt-stricken by what he has done and tries to ease the Frenchman's pain." 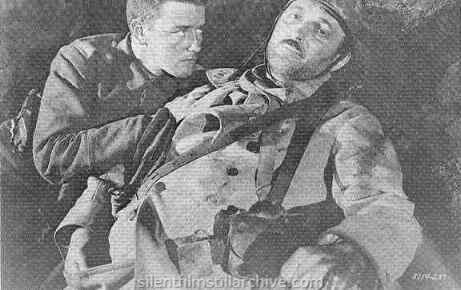 Caption: Lew Ayres and Raymond Griffith in "All Quiet on the Western Front" starting Friday Oct. 20th at the Trans Lux Theatre. "I'd rather do it for nothing than cut my salary." That's a favorite speech in Hollywood. For years actors and actresses have spoken the line to casting directors, but it has just been actually done for the first time. An actor really worked for nothing. 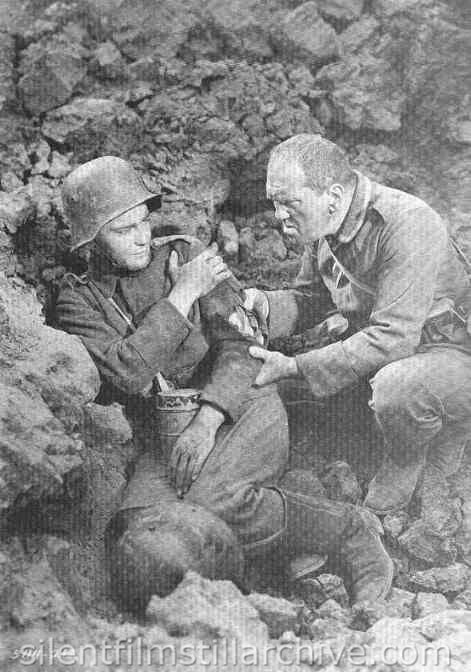 Raymond Griffith, erstwhile Sennett comedian, was sent for by Universal to play the part of the French poilu who dies at the hands of Paul in "All Quiet on the Western Front." It was just a "bit" and the company felt it couldn't afford to pay anything like the customary Griffith salary. Ray was asked to reduce it, but he countered with the famous Hollywood speech. So Universal let him do it. Director Milestone and Griffith have been friends for years and "Mille" had told Ray about the part one Sunday afternoon at Jimmie Gleason's house. Of course, Ray had read the book, and was immediately crazy to do the part. he saw in it not only a chance to do a great piece of work, but being violently opposed to war, he also saw an opportunity of helping to make the picture a great anti-war document. So Ray told Junior Laemmle that he would play the part for nothing and forthwith started raising a beard. In all, it took about a month of his time and if you have seen "All Quiet" it is useless to tell you what a great job the quondam comic did. Hollywood is still talking about it. You have probably seen "All Quiet" by this time, and are talking about it too. 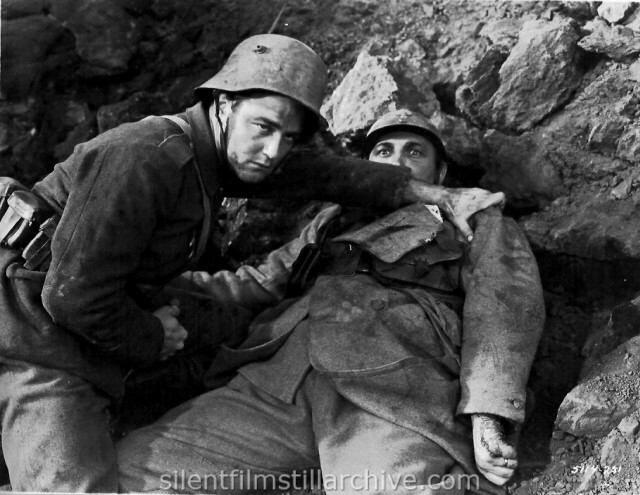 In fact, this brief scene, played in a muddy shell-hole, is probably the best played and certainly the most harrowing in the entire picture. 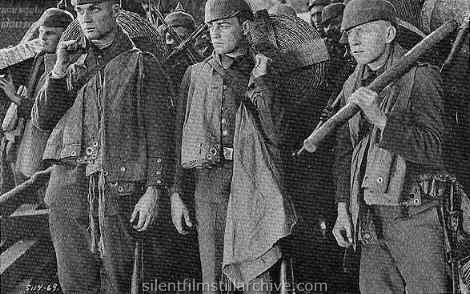 In it Lew Ayres, as the young German soldier, shows his greatest promise -- while Griffith's piece of pantomime is simply superb. 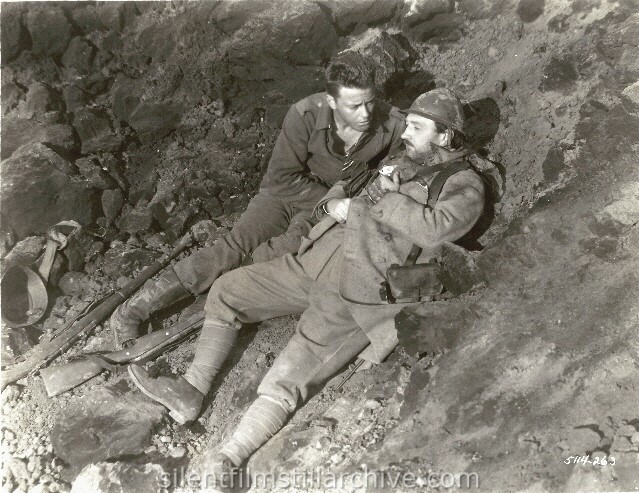 If the tears haven't flowed up to this point, they gush freely when ayres wounds his enemy, then shrieks his grief as he watches the French soldier die. In that one bit is all the tragedy, futility and hopelessness of war. Besides being a little artistic triumph, it is as blasting a piece of anti-war propaganda as the screen has ever seen. To all this, Ray Griffith contributed his art. And the word "art" is used in its proper sense in describing this actor's work. he has been knocked about in Hollywood, partly because of his own bad judgement as a business man. But some day Griffith is going to get a real chance, and another great star will be on his way. P.S. 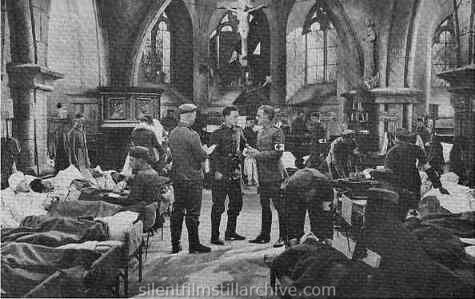 Universal generously provided Ray with the French uniform without any charge whatever. 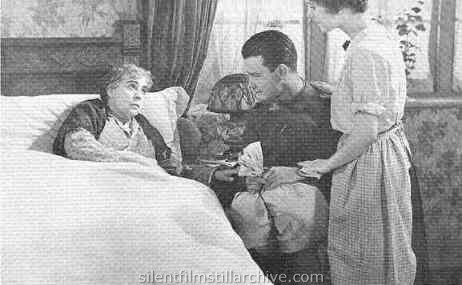 * After previews, Zasu Pitts' scenes were reshot with Beryl Mercer. However, Pitts still appears in at least one trailer for the film. 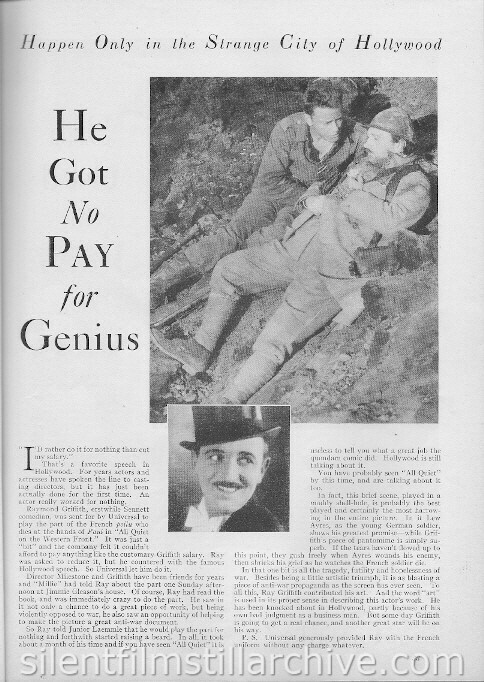 with Lew Ayres, Louis Wolheim and Raymond Griffith. Directed by Lewis Milestone. Universal. Movies of the Thirties by Ann Lloyd, pp. 16-17. 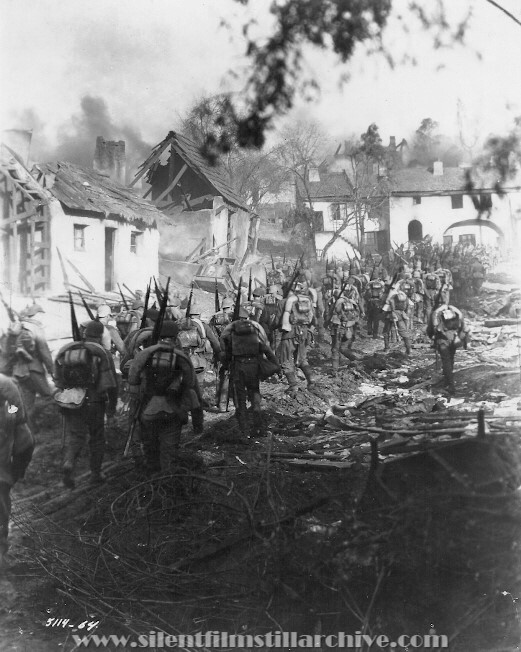 All Quiet on the Western Front: The Story of a Film by Andrew Kelly, entire book. Last Modified April 8, 2014.